On the welcome screen, click "Get Missing Artwork"
All of the tracks which are missing artwork will be displayed. Click "Download Album Artwork"
When you're happy with the changes, click "Save All Artwork to iTunes"
We recommend firstly using the Fix Track Info feature before downloading artwork to your tracks. This will ensure your tracks have the most accurate information, and will enable Tune Sweeper to search more accurately for missing iTunes album artwork. Tune Sweeper is an album art finder and downloader able to detect all of the tracks in your iTunes library that do not currently have artwork. Tune Sweeper can then download artwork for the tracks you choose. Album Art Finder- To see which tracks are missing artwork in your iTunes library, select the "Missing Artwork" tab at the top of Tune Sweeper. Tune Sweeper will then scan your iTunes library. Once Tune Sweeper has scanned your iTunes library, it will display all of the tracks with missing iTunes album artwork in a grid. The tracks will be grouped by album as the artwork will be the same for each track in that album. Album Art Downloader- If you want to download artwork for all of the displayed albums, click the "Download All Missing Artwork" button in the top right corner of the Tune Sweeper window. Tune Sweeper will now attempt to download artwork for each album displayed. iTunes Album Artwork- Once the artwork has been downloaded, you can then save all of the downloaded artwork to iTunes by selecting the "Save All Artwork to iTunes" button also located in the top right of the Tune Sweeper window. If you only wish to save a selection of artwork rather than all of it then please see the "Other Actions" section below. Download Artwork For Selected - This will download artwork only for the albums that you have selected. Load Artwork from File - This will allow you to load in an image from your hard drive for the selected album. Save Selected Artwork to iTunes - This will save any downloaded artwork to iTunes, but only for the albums that you have selected. Undo Downloaded Artwork - This will clear any downloaded artwork from your currently selection should you not want to keep it. 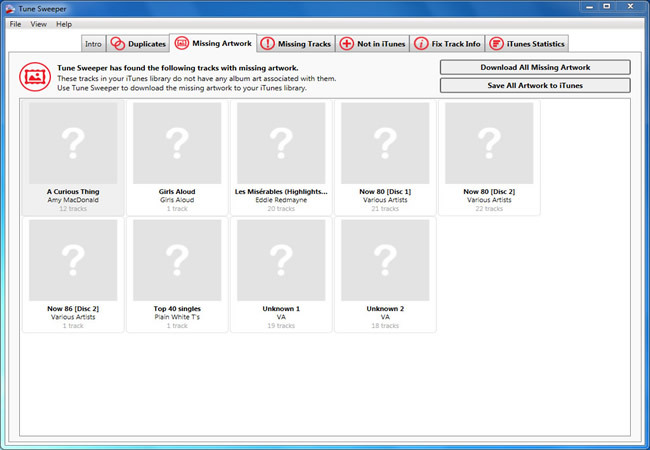 Remove Artwork for Selected - This will remove artwork from the selected music files.